Your body is made up of trillions of "building blocks" called cells, and each is fully able to perform all the processes that define life. Cells produce energy, reproduce, digest nutrients and eliminate waste. In addition, cells are constantly under attack. They are under attack from the outside and within the cell itself. Scientists have learned through decades of research that free radicals are a major threat to the health of your cells. Free radicals constantly attack and damage cells, and set the stage for disease to develop. Your body's best line of defense against free radical damage are powerful antioxidants such as Carotenoid Complex. NeoLife's revolutionary Carotenoid Complex has been clinically proven to reduce the oxidative damage to cellular lipids, which are a critical part of a cell's structure and integrity. 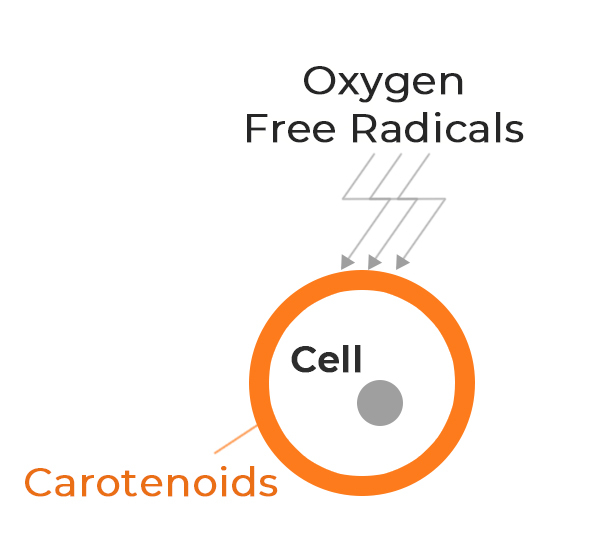 These exciting results show that Carotenoid Complex can reduce the cellular damage created by oxidative stress.